This is a hands on class in dealing with the most common problem bikes have. Attendees bring their bike or wheel (if they already know how to remove and reinstall the wheel) along with any tools, tubes, pumps they have. 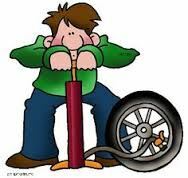 We’ll instruct everyone through a trial tire/tube repair. If members wish to bring fresh tires or tubes they are welcome to. Questions about care, prevention and current trends will be covered. Expect to get dirty.